Judy Goodman is an award-winning author, highly recognized motivational speaker, devoted mother, beloved grandmother and, as others put it, a “teacher of teachers.” For many years, she was immersed in the high-profile public work-force, even being involved in negotiations between Russia and The United States regarding an aircraft of the future. But over 35 years ago, Goodman decided to devote her time entirely to what she says was “always my destiny”— guiding people along both the physical and metaphysical journey of life. Goodman is a trained hypnotherapist and her work, as a teacher and counselor, has taken her all over the United States, Canada, Mexico, The Bahamas, Puerto Rico, Europe, Egypt, and Peru, and has given her the chance to meet with many public figures and celebrities. One of the achievements she is very proud of is her audio book, ‘Journey…The Quest of the Soul,’ which has been downloaded in twenty-three countries. Goodman was a bit ahead of her time when she decided to make the book ‘audio,’ and subsequently re-mastered it into a digital format, allowing it to be downloaded all over the world. 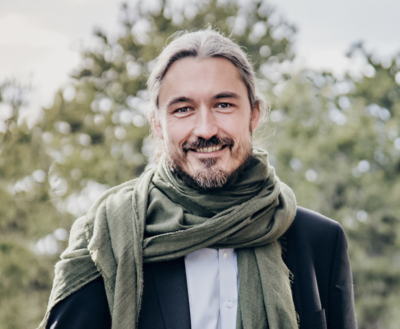 Having served as a Kaiser Institute faculty member, working with professional individuals to develop their intuitive abilities, as well as being a founding board member of The HeartLight Center in Denver, a center for grief support and education, Goodman has had the chance to interact with a variety of clients, from all over the world. She adds that Journey isn’t saturated in case studies or recorded philosophy, rather it is founded on her own understanding, experiences and the knowledge she was born with. 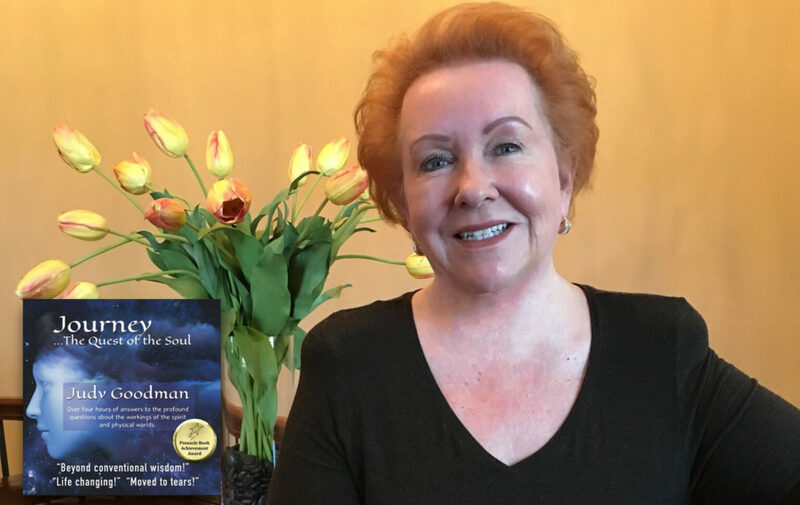 Goodman has long been recognized for her motivational quotes and is currently completing a book of her original work, written over the last 35 years. The title of her soon to be released work is “Changing Your Reality.” The book is full of pictures, many of which were taken by the author herself. Each motivational statement written by Goodman will also feature additional thoughts of how it might be applied to the reader’s life. At this time Goodman anticipates a release in mid-to-late, 2019. Judy Goodman, CPC, CSRC, CRC, Working and Teaching Beyond Conventional Wisdom! Trained in Hypnosis, Certified Professional Coach, Relationship Counselor, Addiction Recovery Coach, Grief Support and, an internationally recognized intuitive. Special Guest Laura Hollick will be on Moments with Marianne, Thursday, April 7th at 5am & 5pm EST on Dreamvisions 7 Radio Network and WMEX1510AM Boston as discuss Living Your Creativity. 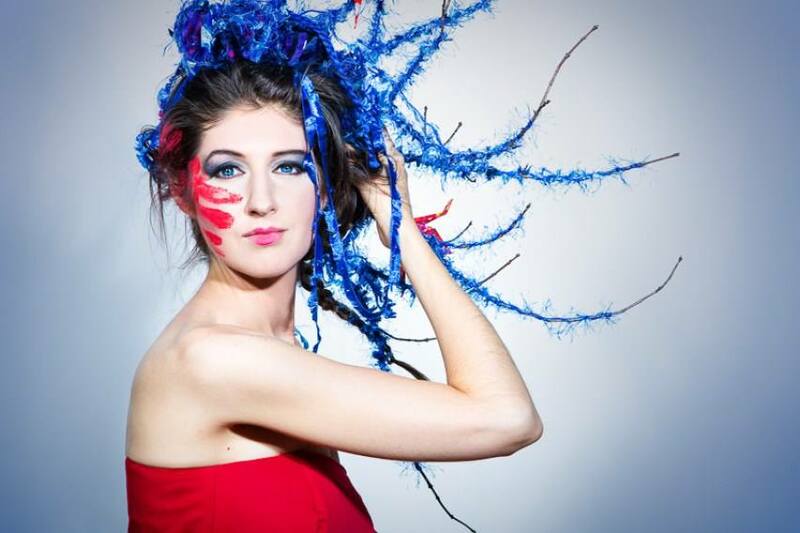 Laüra Hollick is an award-winning artist, creative spiritual entrepreneur and lover of our Earth. She is known as the Soul Art Shaman. After walking 10,000km on a Vision Quest Laüra clarified her purpose and dove into business to realize it. She is the founder of Soul Art Studio Inc., a thriving business devoted to circulating love around the planet with creative inspiration. 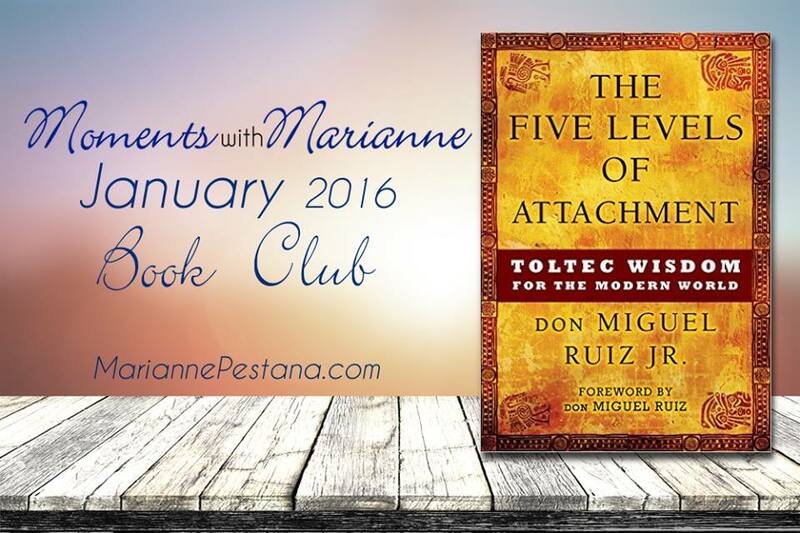 The Five Levels of Attachment by don Miguel Ruiz Jr.​ This is a book that picks up where The Four Agreements left off. Building on the principles found in his father’s bestselling book, Ruiz, Jr. explores the ways in which we attach ourselves inappropriately to beliefs and the world. Accessible and practical, Ruiz’s exploration invites us to look at our own lives and see how an unhealthy level of attachment can keep us trapped in a psychological and spiritual fog. He then invites us to reclaim our true freedom by cultivating awareness, detaching, and discovering our true selves. With the start of this New Year, there is so much to be grateful for. All of the wonderful people and events that have graced my life during the past year have brilliantly paved the way for the magnificence that is yet to come. This I know this to be true for each of us, if we believe it to be so. Recently, I rediscovered a quote from Dr. Wayne Dyer that adds spark my experience whenever I read it. What an encouraging reminder and what a powerful place to stand in the world… empowered, passionate and in full faith of our abilities. For this coming year and all the years to come, I wish you a life where your heart sings in the morning as you wake up and that you stand in the knowing that you are capable of greatness! This is exciting news for those attending Judy’s November 7th. 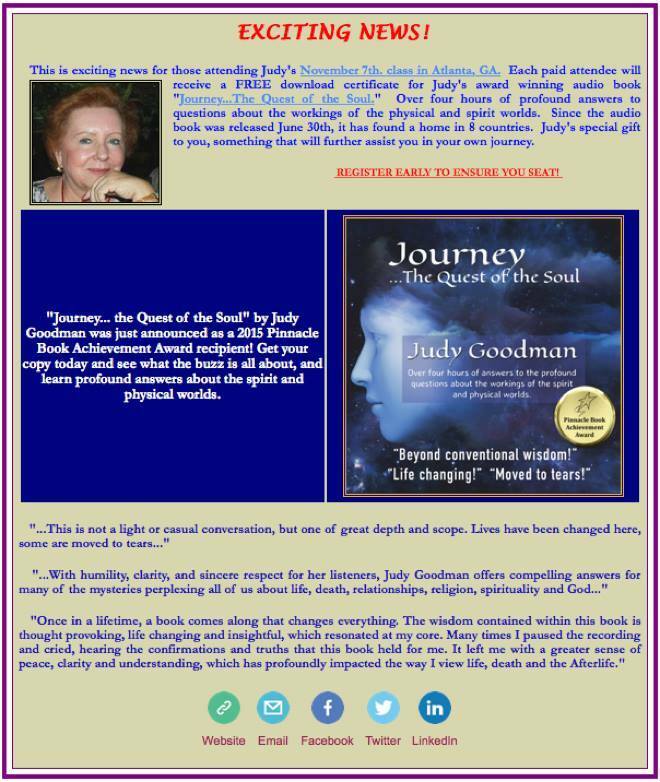 class in Atlanta, GA. Each paid attendee will receive a FREE download certificate for Judy’s award winning audio book “Journey…The Quest of the Soul.” Over four hours of profound answers to questions about the workings of the physical and spirit worlds. Since the audio book was released June 30th, it has found a home in 8 countries. Judy’s special gift to you, something that will further assist you in your own journey. 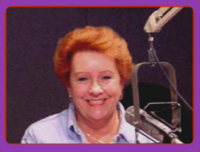 Join me on TODAY, October 16th at 5pm EST with special guest, Nancy Rynes, bestselling author of Awakenings from the Light, speaker and Near Death Experiencer on Moments With Marianne at Dreamvisions 7 Radio Network. Make sure to check out her new book, Awakenings From The Light! Nancy has been called by many of her friends as “the atheist who went to Heaven.” This promises to be a very entertaining interview! Moments With Marianne is heard on Dreamvisions 7 Radio Network every Thursday & Friday at 5pm & 5amEST and every 2nd Sunday at 8pmEST when Dreamvisions 7 Radio Network is live at 1510am WMEX Boston, with listeners in over 135 countries. Showing up in a Big Way! The last few months has been one astonishing moment after another. I can’t begin to express my deepest gratitude for all the wonderful events, opportunities and people that have come into my life. One such moment is the start of my weekly radio show airing on Moments with Marianne at Dreamvisions 7 Radio Network and every second Sunday on WMEX 1510AM Boston! It’s interesting that this opportunity showed up when it did. My inner journey over the last few months has me reflecting on how I could show up in a bigger way and how I could make a greater impact. Almost instantly, the path opened up before me. Judy Goodman told me some time back “when you are on your path, life gets simpler and everything falls into place.” How true that has become over the last few years. The struggle is gone and a greater sense of peace is what rules my world now. This is not to say that everything is always easy for me, I still have the same challenges that everyone else does. Yet my inner peace is at an all time high, along with an strong conviction of who it is that I am and what I have to offer. When we stand in this knowing, these moments not only define who we are to a greater degree, but also gives us the opportunity to shine our light in the world.